Bourdieu's theory of cultural reproduction has been interpreted in various ways, and several authors have criticised an overly narrow interpretation of cultural capital as simply consisting of 'beaux arts' participation. For researchers, this raises the challenge of developing a broader interpretation of cultural capital which is still specific enough to be operationalised. This paper discusses the ways in which parents may transmit educational advantage to their children through cultural rather than economic means, and the forms of knowledge and skill which may be considered as 'cultural capital'. An operationalisation of cultural knowledge is discussed, and empirical evidence is presented on differences in levels of cultural knowledge between the children of graduates and non-graduates. 1.1 Bourdieu's theory of cultural reproduction seeks to explain the link between social class of origin and social class of destination in terms of the impact of cultural capital on educational attainment. Bourdieu's theory has been interpreted in various ways. Several authors have criticised an overly narrow interpretation of cultural capital as simply consisting of 'beaux arts' participation, and have suggested that cultural capital should be seen as including certain forms of skill and knowledge which are rewarded in the education system (Crook, 1997, Ganzeboom, 1982, De Graaf et al., 2000, Sullivan, 2001, Lareau and Weininger, 2003, Farkas, 2003). 1.2 For researchers, this raises the challenge of developing a broader interpretation of cultural capital which is still specific enough to be operationalised. If 'cultural capital' simply denotes skills which are rewarded within the education system, and cannot be distinguished from 'academic ability', then the argument that cultural capital leads to academic success could easily be seen as circular. Thus, it is crucial to discuss which forms of knowledge and skill can be seen as representing 'cultural capital', and to be specific about the mechanisms through which parents may promote academic success in their children. 1.3 Furthermore, we need to consider whether, or to what extent, schools' rewarding of cultural capital implies that the curriculum and assessment criteria are 'arbitrary', and are rigged to favour the middle class. The role of the curriculum and assessment practices in perpetuating class inequalities in educational attainment has been widely discussed, yet empirical evidence on these questions has been lacking. 1.4 There are many forms of knowledge and skill (as well as other characteristics) which are rewarded by the education system, and many mechanisms through which parents may promote these characteristics in their children. This poses an enormous challenge for researchers who wish to examine these processes empirically. What is the link between social class, cultural knowledge and attainment? What are the means � including but not limited to cultural participation � through which highly educated parents produce cultural capital and 'ability' in their children? To what extent does the nature of the curriculum, and assessment criteria and practices produce social class inequalities in academic outcomes? 1.6 This paper explores the implications of these questions for researchers interested in social class inequalities in education. It discusses the various ways in which parents may transmit educational advantage to their children, and unpacks the forms of knowledge and skill which may be considered as cultural capital. Focussing on the question of the link between class, cultural knowledge and attainment, I illustrate a step towards a wider approach to the empirical investigation of cultural capital, by presenting an operationalisation of one form of cultural knowledge � a knowledge of the wider culture of the arts, science and politics. More broadly, I suggest that the process of operationalising theoretical concepts provides a discipline which is as important to theoretical development as it is to empirical work. 1.7 Thus, the purpose of this paper is to disentangle some of the key strands in the theory of cultural reproduction, and to clarify its central concepts, with an eye to operationalisation, and the development of theory through empirical research. 2.1 It is well established that some forms of cultural participation are linked to educational attainment. Highly educated adults are more likely to participate in cultural activities, and children's cultural participation is linked to their success in gaining educational credentials. But there are competing views as to the reason for the link between cultural participation and educational attainment. Ganzeboom (1982) distinguishes between two key strands in the literature on cultural reproduction, the 'status-seeking theory' of cultural consumption, and the 'theory of information processing'. 2.2 The status-seeking theory is based on the view that individuals conform to social norms associated with their status, and that participation in high culture is linked to high status. On this view, highly exclusive cultural activities communicate status more effectively than less exclusive cultural activities, and public cultural consumption communicates status more effectively than private cultural consumption. So, a trip to the theatre denotes status more strongly than reading a book. 2.3 On the 'information processing' theory, cultural stimuli are sources of complex information, and people have different levels of ability to process information, and different levels of familiarity with any given cultural field. An individual's enjoyment of cultural participation is determined at least in part by their ability to understand it. Ganzeboom (1982) interprets his finding of a high level of association between cultural knowledge and cultural participation as evidence for the view that high levels of knowledge and skill allow people to understand and enjoy cultural stimuli, therefore making cultural participation more likely. However, it is plausible that cultural participation also promotes the development of cultural knowledge, which in turn allows greater cultural appreciation, making further cultural participation more likely. 2.4 Of course, these two accounts of the link between education and cultural participation are not mutually exclusive. It is quite plausible both that cultural participation is more enjoyable for those with certain types of knowledge and skill (for example, reading is not very enjoyable for people who find it difficult), and that cultural participation communicates a certain social status. Indeed, one could argue that cultural participation communicates status precisely because it is generally linked to a set of knowledge and skills. 2.5 Furthermore, we can distinguish the question of whether cultural participation communicates social status in a particular society from the question of whether the communication of status is what links cultural participation to educational attainment. Bourdieu (1984) describes the use of cultural tastes as a marker of social status in France. Chan and Goldthorpe (2003; 2004) argue that forms of cultural consumption such as the type of newspaper readership and music listened to serve to communicate social status in England. Conversely, Lamont (1992) argues that cultural participation and tastes are not an important marker of status for her sample of upper-middle class men in the US. But, whether or not cultural participation is an important marker of status in a society, the question remains whether cultural participation is an important determinant of educational outcomes. 2.6 Some empirical work in the field of cultural capital and educational attainment has been implicitly based on the 'status-seeking' theory, in that it is assumed that cultural capital implied participation in public and highly exclusive activities, such as theatre and gallery attendance (Lamb, 1989, Katsillis and Rubinson, 1990). Other authors have examined the link between young people's cultural participation and educational attainment in greater detail, unpacking the concept of cultural capital in order to assess which types of cultural participation are linked to educational outcomes (Crook 1997; De Graaf, De Graaf, and Kraaykamp 2000; DiMaggio 1982; Sullivan 2001). 2.7 Crook (1997) and De Graaf (2000) break cultural participation down into two categories 'beaux arts' and reading. Public and highly exclusive forms of cultural participation, such as art gallery, theatre and concert attendance, are categorised as 'beaux arts'. These activities are seen as the most effective for communicating status. In contrast, reading is a solitary activity, and is relatively common. Reading is linked to 'information processing' and cultural knowledge. Both Crook and De Graaf find that reading is strongly associated with academic success whereas beaux arts participation is not, and infer from this that the effect of cultural capital is due to the 'educative resources' such as analytic and cognitive skills which are developed by reading, rather than to the communication of status through participation in formal culture. However, this inference may be questioned, since one could argue that participation in 'beaux arts' may contribute to the development of skills and knowledge, or that students' reading behaviour is as likely to communicate status, and prejudice teachers in their favour, as is participation in 'beaux arts' activities. 2.8 The cultural activities designated as 'beaux arts' are all public forms of cultural participation � i.e. they take place in public spaces such as art galleries and theatres, rather than in the home. But does the public nature of this type of cultural participation mean that it is more effective than private forms of cultural participation, such as reading, in communicating status? (An immediate problem with this distinction is that reading is often done in public � on public transport for example). People attending concerts, theatres, galleries and museums are unlikely to be noticed in their public acts of cultural consumption. The concept of 'being seen' at the theatre, for example, may have applied once, but seems very dated now. We are more likely to make others aware of our cultural participation by talking about it after the event than by having it witnessed at the time. And it is just as easy to mention a book you have read as a play you have seen. People who attend book groups make reading into a public, group activity, rather than a private, solitary activity. Similarly, social networking websites allow people to share their cultural tastes in a very overt and straightforward way. So, what matters is surely not whether a particular cultural activity takes place in a public space, but whether it can be made public, and therefore used to communicate status. In the context of schooling, children's cultural tastes and activities may only be discussed in certain lessons (e.g. English), so may not be something that most teachers are strongly aware of � although they will no doubt be well aware of the children's manner, vocabulary, styles of expression, etc. � the whole raft of cultural signals with are generally bundled together by Bourdieuians as 'habitus'. 2.9 Both young people's reading behaviour and TV viewing habits (watching relatively 'highbrow' programmes) are significantly associated with examination results (controlling for parents' social class and educational level) (Sullivan 2001). Neither public cultural consumption (art gallery, theatre and concert attendance) nor private 'highbrow' music participation (playing an instrument, listening to classical or jazz music) are linked to educational attainment in this way. This suggests that the important distinction is not between public and private cultural participation, but between language based and non-language based cultural forms. Literature uses words to transmit content. The reader absorbs not just the content, but also vocabulary and styles of expression. The same can be said of television. Visual and musical forms, do not transmit information as such, and do not develop linguistic fluency, which is a fundamental skill which is rewarded within the school. And Ganzeboom's description of cultural stimuli as sources of complex information seems less apt when applied to the visual arts or music than to literature. A painting or a piece of music is not often a source of information as such (unless we mean 'information' about itself). Transmitting information about the wider world is the distinctive role of media based on the written or spoken word. Without these information media (books and other written material, TV, internet, film, radio), the individual would be confined to a small world of limited information provided by their family, teachers and social circle. These media provide the individual with unlimited information. The ability to filter and process this type of information is a crucial academic skill, as is the ability to manipulate language. 3.1 A recent paper by Lareau and Weininger (2003) argues that most studies of cultural reproduction reflect a 'dominant interpretation' of the concept of cultural capital, in which "researchers assume that the effects of cultural capital must be partitioned from those of properly educational "skills", "ability", or "achievement". (p.568). This description reflects those studies which are based on the 'status seeking' theory of cultural reproduction, but does not reflect the literature described above, which explicitly describes cultural capital in terms of educational skills, abilities and knowledge, described in such terms as 'information-processing', 'cognitive abilities' and 'educative resources'. Lareau and Weininger's division of research into examples of 'dominant' and 'alternative' interpretations appears to be largely based on the methods used rather than the theoretical assumptions underpinning the research (quantitative studies are all classified as reflecting the dominant interpretation). Nevertheless, the point that academic ability and cultural capital cannot be readily partitioned from one another is an important one, and raises some interesting questions. 3.2 It seems reasonable to designate those forms of knowledge and skill that are transmitted within the home and rewarded within the school as 'cultural capital', yet the breadth of this definition is potentially problematic. If we simply label academic 'ability' as 'cultural capital', then the claim that social class differentials in academic attainment are due to social class differentials in cultural capital could be seen as circular - although not entirely so, as academic outcomes are not entirely determined by tested academic ability. The claim would of course be entirely circular if we labelled all skills, behaviours and characteristics rewarded by the school as 'academic ability'. So it is important to discuss what is meant by academic ability, and what we mean by cultural reproduction of academic ability and academic attainment. 3.3 It is clear that parents with high levels of academic ability, broadly defined, transmit this to their children in various ways. Academic ability can be defined as any form of intellectual skill or knowledge which is rewarded in academic assessments within schools and other educational institutions. Of course, considerations other than a student's intellectual performance can affect the grades or other rewards given by the school. Academic ability is seen as distinct from these other characteristics and behaviours which may be rewarded in the school, such as 'appropriate' behaviour in class. It will be useful to break down the concept of 'academic ability', since there are various skills rewarded by the school, and the role of parents' cultural resources in transmitting 'ability' may not be the same for all forms of academic ability. 3.4 Bourdieu could hardly place greater stress on the importance of linguistic sophistication. 3.5 Bourdieu may exaggerate the importance of the manipulation of academic language in science examinations, but it is undeniable that students who have a grasp of formal language, rather than being restricted to informal language, are at an enormous advantage in the education system. This recalls Bernstein's (1973) distinction between the 'restricted code' which is accessible to both the working and the middle class, and which is characterised by a low level of vocabulary and limited syntactic variety, and the 'elaborated code' which belongs to the educated classes, and which has a flexibility which facilitates the expression of analytical and abstract ideas and arguments. 3.6 The ability to collect and interpret relevant information on a given question is distinct from, but strongly related to, language skills. 3.7 The knowledge which is rewarded within the school includes command the knowledge transmitted within the school, but also, a broader cultural knowledge which is not necessarily transmitted within the school � an awareness of the wider 'dominant culture', in terms of literature, music, politics, art, science, etc. 3.8 Successful students also have a grasp of the 'rules of the game' regarding what is rewarded within academic assessments. Bourdieu suggests that the more vague these criteria are, and the less explicit they are made, the more disadvantaged students who are not from the 'cultured classes' will be. "Students from the cultured classes are those best prepared�to adapt themselves to a system of diffuse, implicit requirements�"(Bourdieu and Passeron, 1979)p.75. 3.9 Problem solving and logical reasoning are often seen as 'real' or 'pure' intelligence, and as reflecting genetic endowment, as opposed to knowledge and linguistic fluency, which are generally regarded as being learned. In fact, there is no test that will solely capture genetic differences without picking up environmental ones, and typical IQ tests measure school-like learning to some degree (Fischer, Hout, Jankowski, Lucas, Swidler, and Voss 1996). Reasoning skills (both verbal and mathematical), can be distinguished in principle from language and knowledge, but in practice, all tests require a degree of linguistic competence, and a knowledge of the 'rules of the game' in terms of the requirements of the assessment. In addition, logical reasoning is in itself a learned skill. 3.10 One could add many more categories and sub-categories of ability - 'creativity' for example, and talent in particular fields such as music or sports. However, I have limited this categorisation to the core abilities that are strongly rewarded within 'academic' school subjects. 4.1 The cultural reproduction of academic attainment may be distinguished from economic and social reproduction. Social capital refers to 'the set of resources that inhere in family relations and in community social organisation and that are useful for the cognitive or social development of a child or young person' (Coleman, 1994)(p. 300). This includes the attention given to the child within the home, as well as networks and norms within the school and in the wider community. One should not ignore the role of material resources, which can have an impact on educational outcomes in several ways. Well-off parents have access to better schools, and additional tuition for their children. They can afford to invest more in their children's post-compulsory (further and higher) education. Educational resources such as a computer, a room of one's own for study, etc. are costly. Financial resources can also have indirect impacts on the quality of children's environments, for example, poverty leads to stress which may affect parenting (Whitty, 2002, Duncan and Brooks-Gunn, 1997, Mortimore and Whitty, 2000). Nevertheless, financial differences alone cannot account for the impact that parental social class and educational level have on children's educational outcomes (Mayer, 1997). 4.2 The transmission of educational attainment via cultural capital takes many forms, and is not restricted to participation in cultural consumption. It is important for researchers to distinguish between these different mechanisms, in order to analyse their impact on educational outcomes. 4.3 Cultural participation: For Bourdieu, cultural participation is crucial to the reproduction of educational and occupational advantage. Empirically, participation in beaux arts or public cultural activities is not strongly associated with educational attainment, but reading behaviour appears important. It is likely that reading behaviour both reflects a child's reading ability and further develops this ability. 4.4 Active transmission of skills and knowledge: Parents deliberately teach their children, reading to them in the early years, and, later on, coaching them in school subjects. Not all parents are equally aware that these forms of help are expected by the school. In addition, parents' ability to help effectively will be partly determined by their own academic abilities. 4.5 Passive transmission of skills and knowledge: Children inevitably pick up styles of speech and vocabulary, though talking to their parents, and hearing their parents talk to each other and to others in their social circle. Hearing parents discuss particular topics will also expose them to ideas, information, and forms of argument. These forms of passive cultural transmission are likely to be crucial in a child's development of language and cultural knowledge, yet have been given less empirical attention than has been given to active transmission through activities such as reading to children. 4.6 To the extent that the active and passive transmission of skills and knowledge from parents to children are important, we should expect a very strong correlation between parents' and their children's tested skills and knowledge. In particular, given that language is transmitted in the home, and some children are exposed to a much larger range of vocabulary at home than in the school, we should expect a strong link between parents' and children's vocabularies. 4.7 Attitudes, beliefs and behaviours: Parents instil attitudes regarding work and education. It is often suggested that middle-class parents instil their children with a particularly strong work-ethic (Saunders 1995). Parents may instil a sense of efficacy in the child � encouraging them to view themselves as academically able. Such attitudes and beliefs may be transmitted actively (through conscious efforts to promote them) or passively (as children pick up the beliefs and habits of their parents more or less unconsciously). Attitudes, beliefs and dispositions are often termed 'habitus'. However, this concept of a 'system of dispositions'(Bourdieu 1977) p.495 is vague, and does not encourage researchers to be specific in identifying particular attitudes and beliefs which they believe to be important. Assumptions are often made regarding class differences in attitudes and beliefs, in the absence of empirical evidence, so this is an area which demands further research. 4.8 Social styles: Schools do not exclusively reward 'academic ability', but can also reward certain social styles and behaviours, including students' and their parents' styles of interaction with the school (Farkas et al., 1990, Lareau and Horvat, 1999, Lareau, 2000, Lareau and Weininger, 2003). It is not clear to what extent parental styles of interaction with the school may actually affect outcomes for students. Regarding students' styles and behaviours within school, Farkas et. al. (1990) find that work habits have an impact on tested coursework mastery, but work habits also have a large, independent impact on grades awarded by teachers, independent of coursework mastery. Thus, work habits are rewarded twice. In this study of US students, ethnic, gender and income effects on high-school grades were largely explained by work habits and coursework mastery. 4.9 This list is not exhaustive, but aims to capture some of the main ways in which 'cultural capital' affects children's educational chances. All these mechanisms may also have direct effects on individuals' occupational chances. 4.10 It is difficult to develop measures which can tap into these processes, and the measures we develop will never be perfect. It might be tempting to despair of this project, and, in particular, to reject quantitative investigations of cultural reproduction altogether, on the grounds that quantitative measures will only ever give us crude proxies for subtle cultural processes. Qualitative studies can provide us with a wealth of rich detail regarding these cultural processes, and the interactions between students', parents and teachers in particular local settings. However, the question of whether cultural capital (however defined) has any impact on educational outcomes is essentially a quantitative one. In addition, the process of operationalising theoretical concepts such as cultural capital is very useful in that it demands that we are clear and specific in defining these concepts. 5.1 In his discussion of the 'cultural arbitrary', Bourdieu describes the way that working-class attempts to appropriate higher class culture can be treated with disdain by university teachers in France. The implication here is that the purpose of certain academic values is to exclude certain students from academic success. So, for example, hard work is denigrated, and there is '�a tendency to prefer eloquence to truth, style to content. '(Bourdieu 1967) p335. Bourdieu focuses on the arts and humanities departments of �lite French universities, and finds evidence of diffuse and arbitrary standards (Bourdieu 1974). However, the extent to which these standards apply in secondary schools, and what impact they may have on socially structured inequalities in educational outcomes, is less clear. Also unclear is the extent to which Bourdieu is simply critiquing particular elitist values in education, and the extent to which he is putting forward a relativistic argument regarding 1. the basis for knowledge, 2. the basis for the curriculum, 3. the basis for assessment criteria. 5.2 The sociological insight that academic curricula and what counts as knowledge are social constructs, which are culturally and historically contingent, is of course far from new (Karabel and Halsey 1977). Weber's essay on the Chinese Literati points out the way in which dominant groups are able to define the particular cultural knowledge that is necessary in order to be considered as part of the 'cultivated' elite '�the pedagogy of cultivation�attempts to educate a cultivated type of man, whose nature depends on the decisive stratum's respective ideal of cultivation'. (Weber 1974) (P427). 5.3 Bourdieu's arguments regarding the arbitrariness of knowledge have overlaps with the 'new sociology of education' of the 1970s, which proposed that what counts as knowledge should be the central question to be addressed by sociologists of education. This movement took a more explicit position regarding knowledge than did Bourdieu, comparing the "dogmas of rationality and science" to the "feudal, clerical and market dogmas of earler cultures" (Young 1971). The new sociology of education was concerned primarily with critique rather than empirical work, and was criticised for raising philosophical rather than sociological questions (Pring 1972). It was also attacked from a Marxist perspective, on the grounds that "�its relativist position with relation to knowledge...provides a new ideological means of denying to the working class access to knowledge, culture and science" (Simon 1976)(p. 273). Young has recently acknowledged the force of this criticism, stating that it does disadvantaged children no favours to structure the curriculum around their knowledge, rather than allowing them to move beyond it. Young has further acknowledged that this movement failed to provide positive proposals regarding the curriculum (Young 1999). 5.4 Clearly, the acknowledgement that academic ability is not a 'culture free' concept does not imply that the education system simply creates educational inequalities by arbitrarily rewarding middle-class characteristics. We need to draw a distinction between academic criteria which are elitist in the sense of being exclusive for exclusivity's sake, and those which are universally valuable, but not equally accessible to all classes. 5.5 As Gramsci (1971) points out, there are many reasons why the child of a 'traditionally intellectual' family aquires learning more easily than the child of a working class family, but this should not be taken to imply that the difficulty of study is simply based on some kind of 'trick'. Whatever abilities the education system decided to reward, the privileged classes would be advantaged in developing those abilities in their children. In a class society, regardless of the academic standards applied, upper and middle class families would have greater resources at their disposal to achieve those standards. But this does not imply that all the abilities rewarded are arbitrary. At the most basic, literacy and numeracy are clearly skills which people need to function in contemporary society. The ability to gather and process information, and to reason logically are also of obvious value to all classes in society. The fact that the education system rewards such abilities is therefore not arbitrary. Any education system which failed to promote these abilities clearly would have failed. 5.6 Enormous increases (up to 25 points) in average IQ have occurred internationally in the course of one generation (Flynn 1987). Some of the largest test score increases have occurred in tests of 'fluid intelligence' or 'decontextualised problem solving'. Interestingly, Flynn notes that 'Culturally reduced content has maximised culturally influenced performance' (1987:188). Efforts have been made to strip IQ tests of obvious cultural biases (so that answering questions is not dependent on specific cultural information, such as knowing what a regatta is, or familiarity with the rules of chess). But it seems likely that the huge increase in scores on abstract problem solving is linked to the fact that we live in a culture where abstract problem solving is increasingly highly valued. In the sense that different cultures value different abilities and skills to varying extents, no test of intelligence can ever be completely 'culture free'. 5.7 Kingston (2001) suggests that the criteria used in academic assessments in the US are not arbitrary because they are linked to economic productivity. Whereas Tawney speaks of "the disinterested desire of knowledge for its own sake, the belief in the free exercise of reason without regard to material results and because reason is divine�" (Tawney 1914). While economic productivity is clearly important, it should not be seen as the only valid educational goal. Social and intellectual goals are also important The promotion of critical thought, for example, may not be seen as economically necessary (at least not for the whole population). It may even be seen as unrealistic to expect the school system to promote critical analysis, as this is in conflict with the preservation of the existing social order (Simon 1994). Yet one can argue that critical thought is precisely what education should be about, if we do not want to live in a society where too many people are too easily fooled � whether by government propaganda or media scares. (For example, widespread belief in a link between the MMR and autism can be seen as an indictment of British science education). Similarly, one can argue that education should promote cultural engagement, regardless of whether this makes people more (or less) economically productive. Highly educated people have been shown to be 'cultural omnivores' (Bryson 1996; Longhurst and Savage 1996; Peterson 1997; Peterson and Kern 1996), while people with lower levels of education draw from a narrower cultural palate. Gayo-Cal et. al. (2006) find that the cultural tastes of the educated middle-class are defined by likes rather than dislikes, while dislikes and avoidances of a large range of cultural forms characterise the most poorly educated group. The most culturally disengaged group disliked established high culture, but had '�no alternative positive preferences to suggest some substitute vibrant popular cultural life' (p.219). The promotion of curiosity and cultural breadth can be seen as worthwhile in its own right, regardless of whether it is linked to economic productivity. So, there will always be disagreement regarding the proper aims of the education system and how they should best be pursued. One person's clear example of an arbitrary value will be seen as a universal value by others. Perhaps the most we can expect is that these values should be open for debate. 5.8 The extent to which academic assessments are based on arbitrary criteria has not been given as much attention as the related but distinct question of teacher bias in awarding grades. There is every reason to expect that the level of arbitrariness, as well as the level of ambiguity in assessment criteria, will vary cross-nationally, and according to the academic subject, and the stage of the education system in question. Arbitrariness and ambiguity may be expected to go hand-in-hand to some extent, as the process of setting out explicit, non-ambiguous assessment criteria, which will be externally enforced, means that assessment criteria are open to external scrutiny and criticism. The external enforcement of assessment criteria makes it more likely that the official assessment criteria match the real assessment criteria. Whereas individual teachers are likely to vary in the criteria according to which they judge coursework, external examiners have to work to common standards. In addition, assessments by individual teachers who know their students leave scope for direct bias. Of course, even in systems where teachers do not determine students' final grades, grades given throughout schooling can serve to encourage or discourage students, and therefore indirectly affect the final outcome. Nevertheless, we may expect to see important differences between education systems which are primarily driven by external examinations (such as the current British school system) and those which are primarily driven by internal assessments (such as the US system). 5.9If we acknowledge that it is not possible to make a neat separation between cultural capital and ability, then we also have to acknowledge that is not possible or desirable for educational assessments to avoid rewarding cultural capital. Even if the education system fully achieved the aims of communicating clear assessment criteria to students, and ensuring that assessments do not reward irrelevant student characteristics, it must be acknowledged that inequalities in educational outcomes would remain, given the greater resources the privileged classes can marshal in order to promote 'ability' or 'merit' in their children, regardless of how ability and merit are defined. Theoretical contributions to this discussion from Bourdieu and others have left very much open the empirical question of the extent to which class inequalities may be driven by a particular curriculum which favours the privileged classes, and could be reduced by some other sort of curriculum. But it seems clear that class inequalities in any meaningful educational outcome will not be reduced by attempting to remove all cultural forms which are associated with the privileged classes from the curriculum. 6.1 Operationalisation is the process of pinning down a theoretical concept in such a way that it becomes measurable. This is obviously a necessary process for empirical researchers who wish to engage with theory. But often researchers are constrained by the variables available in a particular dataset, and therefore may not consider what measures would be best suited to their purposes if they were not subject to such constraints. At worst, this can result in crude proxies for theoretical concepts being used in a fairly unreflexive way. The fact that sociologists usually begin with a set of items that have been included in an existing survey, rather than starting with a concept and trying to develop a scale to measure this concept, is due to the importance that is placed on analysing large-scale representative samples of the population (Heath and Martin 1997). This is understandable, but unfortunate, because the process of operationalisation introduces strictures which are helpful to the refinement and development of theory, as well as to the development of empirical work. I.e. In order to operationalise a concept, the researcher is forced to impose a degree of clarity and precision on the concept itself. The study of cultural reproduction could particularly benefit from this, as there is always a danger that the concepts used by Bourdieu are amenable to becoming catch-alls, which are too flexible and all encompassing to rule anything out or to tell us anything interesting. This section illustrates the usefulness of the process of operationalisation using the example of a scale measuring cultural knowledge. 6.2 Many surveys contain tests of reading and writing skills, and of problem-solving ability/ reasoning skills. However, the area of cultural knowledge has been neglected. There is a canon of information which any 'educated' person is expected to have. Clearly what this information is is culturally specific, and will vary cross-nationally. If a person of high social status and/or high educational attainment gives away ignorance of this sort of information, this may well encourage others to re-evaluate this person's status as an 'educated' or 'intelligent' person. Conversely, a person who is of low occupational status and who is lacking formal educational credentials can communicate their status as 'cultured' and 'intelligent' by demonstrating a grasp of the dominant culture. 6.3 I have developed an operationalisation which is intended to give an indication of an individual's knowledge of the dominant culture. (More information on the study is contained in appendix 1). This test is intended to assess the type of knowledge which is expected of the 'educated' or 'cultured' person. The test reflects the broader cultural knowledge which is not necessarily transmitted by the school. The aim is to gauge the individual's general awareness of this wider culture, rather than their ability to actually 'do' any particular subject. 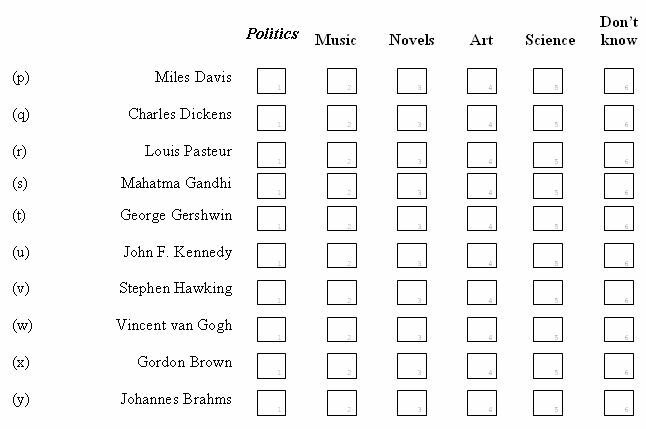 6.3 The test of cultural knowledge consists of asking pupils to categorise 25 famous cultural figures according to whether these figures are most strongly associated with politics, music, novels art or science. The form of the test items is shown in appendix 2. Thus, to answer the questions correctly, respondents only needed a very basic awareness of what each figure was known for. The figures were chosen to reflect both past and contemporary culture, and items were pitched at different levels of difficulty in order to give a scale that could differentiate well between individuals in the sample according to their level of cultural knowledge. So, some figures were intended to be identifiable by practically anyone, while others were intended to be more difficult. Figure 1 shows the level of correct responses to the cultural knowledge test, broken down according to the educational level of the parents (graduate or non-graduate). 6.4 While the sample is not nationally representative in all relevant respects, the students in the sample are reasonably representative in terms of their academic attainments. 41% of the sample gained 5 or more GCSE passes at grade C or above, compared to 46% of the English population of the relevant age group in 1997/8. 6.5 The children of graduate parents gained a higher proportion of correct responses than the children of non-graduates for each item on the test. However, the gap between the children of graduates and no-graduates tended to be least in those cases where a figure was either almost universally known, or hardly known at all. 6.6 The level of knowledge of scientists was generally quite low, and only Einstein could be identified as a scientist by a majority of respondents. But the fact that one in ten respondents apparently did not know that Einstein was a scientist still seems a little shocking, as most people would probably take it for granted that this is something that �everyone knows�. The children of graduates were more than twice as likely as the children of non-graduates to correctly identify Galileo and Marie Curie. 6.7 The modern novelists were far less well known than the pre-20th Century examples, Dickens and Austen. This reflects the strength of Dickens� and Austen�s place in mainstream British culture, as they are staples of both cinema and television adaptation. The contemporary novelist Martin Amis was the least known figure in the study. Graham Greene is only slightly more known than Amis, despite being an important novelist, several of whose books have been adapted for film and TV in the past. But this is not reflected in current TV schedules or any very recent films, and this may account for the lack of awareness of this author on the part of the respondents. 6.8 Bill Clinton was the best known figure in the survey, with 94% correctly identifying him. John F. Kennedy was also well known, probably due to an eponymous film that had been at the cinema shortly before the questionnaire was administered. Only a quarter of respondents could correctly identify Karl Marx, and the children of graduates were nearly 4 times as likely to do so as the children of non-graduates. 6.9 Among musicians and composers, only Mozart was correctly identified by a majority. Miles Davis and George Gershwin were even less well known than any of the figures associated with classical music. The example of Gershwin illustrates the fact that �popular culture� for one generation can gain obscurity and exclusivity for later generations. The children of graduate parents were 3.5 times more likely than the children of non-graduates to correctly identify Gershwin. However, the gap was even wider for Miles Davis. Pupils with graduate parents were over 5 times more likely than pupils with non-graduate parents to correctly identify him. This reflects the status of jazz music as being outside the mainstream, and therefore not receiving a large amount of air-time on TV or radio. 6.10 Van Gogh and Picasso were both correctly identified by a large majority of respondents. The least known artist was Andy Warhol, who was correctly identified by less than a quarter of respondents, despite his association with popular culture. Of course, �popular� culture can be exclusive, and �highbrow� culture can be mainstream. Those elements of high culture which are so well-established that they are promoted within the media, and become universally accepted as good or at least �good for you� inevitably lose their exclusivity. 6.11 The broad cultural knowledge examined here, in common with linguistic fluency, is most strongly transmitted within the home rather than the school, and yet is inevitably rewarded within the school. "By doing away with giving explicitly to everyone what it implicitly demands of everyone, the educational system demands of everyone alike that it has what it does not give. This consists mainly of linguistic and cultural competence and that relationship of familiarity with culture which can only be produced by family upbringing when it transmits the dominant culture. "(Bourdieu and Passeron, 1990) p. 494. 6.12 So, while explicit teaching of the dominant culture is often seen as politically regressive, it would be na�ve to think that removing this information from the curriculum creates a level playing-field � in fact, the absence of the dominant culture from the curriculum ensures that this culture is the sole property of those who have inherited it within the home. 6.13 In a model of educational attainment at age 16 (Sullivan, 2001), students' cultural knowledge and vocabulary scores entirely mediated the effects of both cultural participation and of parents' social class and educational level. This suggests that the development of these skills, abilities and knowledge is a fundamental mechanism of cultural reproduction. 7.1 Education is a crucial mechanism of social reproduction, linking class origins to class destinations. The professional classes are more successful than other, less highly educated, sections of the middle class in transmitting their occupational status to their children (Savage, Barlow, Dickens, and Fielding 1992; Savage and Egerton 1997). There has been continued interest in the way in which (sections of) the middle and upper classes use their cultural resources to promote educational attainment in their children. 7.2 Much research has focused on the link between cultural consumption and educational attainment. Ganzeboom draws a distinction between private cultural consumption, which he links to information procession, and public cultural participation, which he links to the communication of status. However, I have argued that the important distinction is not between �public� and �private� cultural consumption, but between verbal or literary forms which use words to transmit content, and visual or musical forms which are not based on words. Word-based culture is linked to academic ability, both because the skills required to enjoy this type of culture are academic skills which are rewarded within the education system, and because the consumption of word-based culture develops important academic abilities, such as linguistic fluency and broad cultural knowledge. While both word-based and non word-based culture can be used to communicate status, only word-based culture is linked to academic ability. 7.3 Parents with high levels of cultural capital promote the development of academic ability in their children in many ways, and participation in cultural activities is just one of these. Most importantly, children pick up vocabulary, styles of expression, ideas, information, and forms of argument from hearing their parents talk. Parents also actively teach their children reading and other skills, and pass on attitudes and beliefs. The role of these mechanisms of cultural reproduction has been under-researched compared to the role of cultural participation. This is an important direction for future research. Several studies have examined the link between cultural consumption and educational outcomes in detail, and this approach should now be applied to the examination of other mechanisms of cultural reproduction. 7.4 The fact that cultural capital is rewarded within the education system should not necessarily be taken as evidence for the �arbitrariness� of academic judgements. Bourdieu�s discussion of arbitrary values in education is largely confined to the arts and humanities departments of French universities, and the role of �the cultural arbitrary� within schooling, and within different academic disciplines in different societies, has not been given much attention. The impact that unclear assessment criteria may have on class inequalities in educational outcomes has not been examined empirically, though the question of teacher-bias in academic assessments has been given more attention. Nevertheless, even when non-arbitrary values are assessed externally according to clear criteria, enormous class inequalities in attainment remain. This further supports a focus on the ability of the privileged classes to promote �ability� in their children. 7.5 Forms of cultural capital such as a high level of linguistic fluency, broad cultural knowledge, and a knowledge of the �rules of the game� of academic assessments are an important part of what we mean by �academic ability�. Even problem solving skills are linked to cultural capital, partly because high level linguistic skills facilitate the development of problem-solving skills. These academic abilities can be distinguished from other styles and behaviours which may be rewarded within the education system, such as interacting with teachers in an approved way. 7.6 The acknowledgement that, in rewarding �ability� schools are also rewarding cultural capital presents researchers with the challenge of operationalising both the mechanisms through which parents transmit cultural capital, and the forms of cultural capital which are rewarded in educational assessments. This paper has presented an operationalisation of cultural knowledge, in terms of familiarity with the arts, science and politics. Children from non-graduate homes had strikingly low levels of knowledge of what many �educated� people sometimes unthinkingly assume is a generally shared culture. For example, only 16% of the children of non-graduates could identify Karl Marx as being associated with politics. 7.7 This operationalisation of cultural knowledge is intended as an illustration of the way in which researchers can tap into a wider range of forms of cultural capital. It also illustrates the way in which the process of operationalisation can help to impose clarity on initially nebulous concepts. Clearly there is an enormous amount of work yet to be done in the field of cultural reproduction, and this paper has indicated some promising future avenues for research in this area. Pupils were surveyed in their final year of compulsory schooling (i.e. year 11 students, about 16 years old) in England, in1998. The sample contained four schools, all of which were Comprehensive. This is not a representative sample of the year 11 population. While a large, representative sample would have been ideal, the sample was inevitably restricted, as I was a Ph.D. student collecting data independently. The corresponding advantage to this was the freedom of designing the questionnaire and including rich measures of cultural capital. A questionnaire was administered for self-completion by pupils. Pupils were not allowed to confer while completing the questionnaire. Pupils and schools were, of course, assured of the confidentiality of their responses. Out of a potential sample of 557 pupils, 465 questionnaires were adequately completed, giving a response rate of 83.5%. The majority of the non-response was due to absenteeism. Parents' educational credentials were determined from pupils' responses. Mother's or father's qualifications were selected according to which was higher. Parents' qualifications are missing in 122 cases. Pupils were surveyed on a broad range of possible components of cultural capital. Reading: type and amount of books read, library use, newspapers read. Television: type of TV programmes watched. Music: type of music listened to, playing an instrument. Participation in 'public' or 'formal' culture: art gallery, theatre and concert attendance. 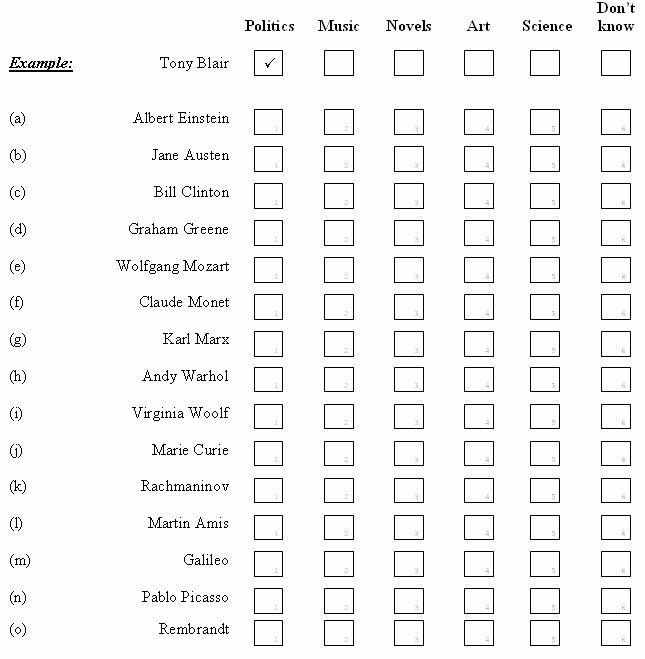 Tested knowledge of famous cultural figures. Active and passive vocabulary test scores. Pupils were also surveyed on their parents' cultural practices. For a more detailed description of this range of variables see Sullivan (2001). 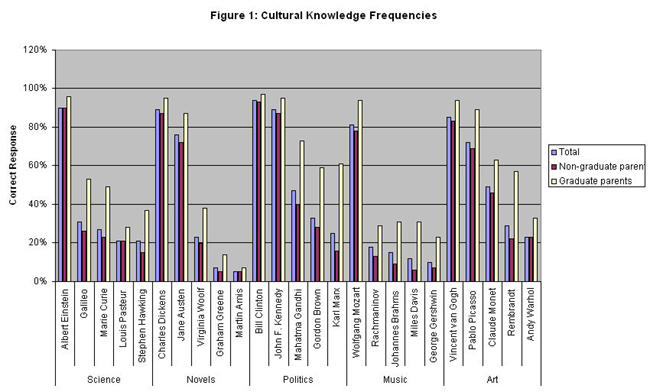 Cultural knowledge was measured on a 25 point scale. 20 pupils failed to give responses to any of these items, and are therefore classed as missing on this scale. The internal reliability of the scale is high (alpha = 0.87). Each of the following names is a person you may have heard of. For each person listed, which do you associate him or her with most out of the following categories: politics, music, novels, art or science? If you do not know, do not guess, just tick "don't know". 1�Non-cognitive� characteristics such as efficacy and industriousness are also rewarded in the labour market, BOWLES, S., GINTIS, H., and OSBOURNE, M. (2001). "Incentive-Enhancing Preferences: Personality, Behaviour and Earnings." American Economic Review 92 (2). 2Debate between Michael Young and Mike Apple, Institute of Education, University of London, 2007. 3In the General Certificate of Secondary Education examination. BERNSTEIN, B. (1973) Class, Codes and Control, Paladin, London. BOURDIEU, P. (1967) Systems of Education and Systems of Thought International Social Science Journal, 19 (3), 338-358. BOURDIEU, P. (1974) The School as a Conservative Force: Scholastic and Cultural Inequalities In Contemporary Research in the Sociology of Education (Ed, Eggleston, J.) Methuen, London. BOURDIEU, P. (1977) Cultural Reproduction and Social Reproduction In Power and Ideology in Education (Eds, Karabel, J. and Halsey, A. H.) OUP, Oxford. BOURDIEU, P. (1984) Distinction: A social critique of the judgement of taste, Routledge and Kegan Paul, London. BOURDIEU, P. and Passeron, J.-C. (1979) The Inheritors, CUP, Cambridge. BOURDIEU, P. and Passeron, J.-C. (1990) Reproduction in Education, Society and Culture, Sage, London. BOURDIEU, P., Passeron, J.-C. and Saint-Martin, M. (1994) Academic Discourse, Polity Press, Cambridge. BOWLES, S., Gintis, H. and Osbourne, M. (2001) Incentive-Enhancing Preferences: Personality, Behaviour and Earnings American Economic Review, 92 (2). BRYSON, B. (1996) "Anything but Heavy Metal": Symbolic Exclusion and Musical Dislikes American Sociological Review, 61 (5), 881-896. CHAN, T. W. and Goldthorpe, J. H. (2003) Social Status and Newspaper Readership Sociology Working Papers, University of Oxford. Chan, T. W. and Goldthorpe, J. H. (2004) Social Stratification and Cultural Consumption: Music in England Sociology Working Papers, University of Oxford. COLEMAN, J. S. (1994) Foundations of Social Theory, Belknap Press, Cambridge, Mass. CROOK, C. J. (1997) Cultural Practices and Socioeconomic Attainment: The Australian Experience, Greenwood Press, Westport, Connecticut. DE GRAAF, N. D., De Graaf, P. M. and Kraaykamp, G. (2000) Parental Cultural Capital and Educational Attainment in the Netherlands: A Refinement of the Cultural Capital Perspective Sociology of Education, 73 92-111. DUNCAN, G. J. and Brooks-Gunn, J. (Eds.) (1997) Consequences of Growing Up Poor, Russell Sage, New York. FARKAS, G. (2003) Cognitive Skills and Noncognitive Traits and Behaviours in Stratification Processes Annual Review of Sociology, 29 541-62. FARKAS, G., Grobe, R. P., Sheehan, D. and Shuan, Y. (1990) Cultural Resources and School Success: Gender, Ethnicity and Poverty Groups within an Urban School District American Sociological Review, 55 127-42. FISCHER, C. S., Hout, M., Jankowski, M. S., Lucas, S. R., Swidler, A. and Voss, K. P. N. J., Princeton University Press. (1996) Inequality by Design: Cracking the Bell-Curve Myth, Princeton University Press, Princeton New Jersey. FLYNN, J. R. (1987) Massive IQ Gains in 14 Nations: What IQ Tests Really Measure Psychological Bulletin, 101 (2), 171-91. GANZEBOOM, H. (1982) Explaining Differential Participation in High-Cultural Activities - A Confrontation of Information-Processing and Status-Seeking Theories In Theoretical Models and Empirical Analyses: Contributions to the Explanation of Individual Actions and Collective Phenomena (Ed, Raub, W.) E.S. Publications, Utrecht, pp. 186-205. KATSILLIS, J. and Rubinson, R. (1990) Cultural Capital, Student Achievement and Educational Reproduction: The Case of Greece American Sociological Review, 55 (2), 270-279. KINGSTON, P. W. (2001) The Unfulfilled Promise of Cultural Capital Theory Sociology of Education, 74 (Extra Issue), 88-99. LAMB, S. (1989) Cultural Consumption and the Educational Plans of Australian Secondary School Students Sociology of Education, 62 (2), 95-108. LAMONT, M. (1992) Money, Morals and Manners: The culture of the French and American upper-middleclass, University of Chicago Press. LAREAU, A. (2000) Social class and the daily lives of children: A study from the United States Childhood, 7 (7), 155-171. LAREAU, A. and Horvat, E. M. (1999) Moments of social inclusion and exclusion: Race, class and cultural-capital in family-school relationships Sociology of Education, 72 (1), 37-53. LAREAU, A. and Weininger, E. B. (2003) Cultural capital in education research: A critical assessment Theory and Society, 32 567-606. LONGHURST, B. and Savage, M. (1996) Social Class, Consumption and the Influence of Bourdieu: Some Critical Issues In Consumption Matters (Eds, Edgell, S., Hetherington, K. and Warde, A.) Blackwells, Oxford, pp. 274-301. MAYER, S. E. (1997) What Money Can't Buy: Family Income and Children's Life Chances, Harvard University Press, Cambridge MA. MORTIMORE, P. and Whitty, G. (2000) Can school improvement overcome the effects of disadvantage? Revised edition, Institute of Education, London. PETERSON, R. A. (1997) The rise and fall of highbrow snobbery as a status marker Poetics, 25 75-92. PETERSON, R. A. and Kern, R. (1996) Changing Highbrow Taste: From Snob to Omnivore American Sociological Review, 61 900-907. SAUNDERS, P. (1995) Might Britain be a Meritocracy? Sociology, 29 (1). SAVAGE, M., Barlow, J., Dickens, A. and Fielding, T. (1992) Property, Bureaucracy and Culture, Routledge, London. SAVAGE, M. and Egerton, M. (1997) Social Mobility, Individual Ability and the Inheritance of Class Inequality Sociology, 31 (4), 645-72. SULLIVAN, A. (2001) Cultural Capital and Educational Attainment Sociology, 35 (4), 893-912. WHITTY, G. (2002) Making sense of education policy, Paul Chapman, London.